The plan to expand the GO train system to 15-minute, all-day two way service could increase some Toronto area property values up to 12 per cent. It could also make housing up to 18 per cent more affordable in some areas of the region, according to a study of 773 communities commissioned by the Toronto Real Estate Board (TREB). But maximizing those benefits depends on local municipalities making it attractive for commuters to get to the station, said the president of a data analytics company that studied the impact of GO’s Regional Express Rail (RER) expansion on Toronto region housing prices and affordability. 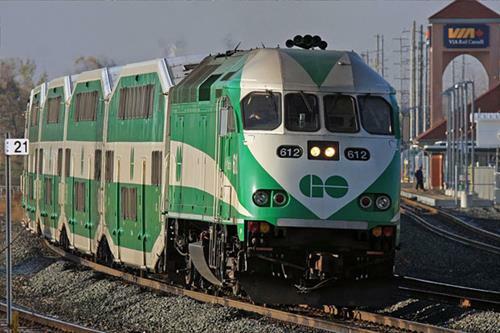 “While the GO station may be close to people it may not be accessible to them,” said Paul Smetanin, president of the Canadian Centre for Economic Analysis (CANCEA). Areas that stand to gain the most in terms of affordability from RER are those outside the city, places such as Barrie, Guelph, Hamilton and King. “A household in Barrie commuting by car could shift their affordability by up to 18 per cent,” he said. Because Toronto is already well served by transit it won’t see the same uplift in land value and improvement in affordability. Housing affordability “has become an increasing middle-class problem across the region,” with almost a third of the Ontario population under extreme housing affordability pressure, said Smetanin. CANCEA has developed a Shelter Consumption Affordability index that expands the measure of the cost of operating a home beyond just the mortgage payments and interest rates. It factors in other costs such as power, access to child care and transportation within the context of household incomes. Housing prices are part of affordability but not the only factor, said Smetanin at an economic conference organized by the real estate board on Tuesday. “Housing affordability is more than just housing prices. Housing prices aren’t a problem if your incomes are going up at the same rate, if you’ve got other expenses associated with housing actually going down,” he said. “When you improve transit you’re allowing families a better choice of properties across the region. They can live further out from the job centres. At the same time there’s a balancing act because when you’re looking at developing land on the outside of the density areas it costs a lot more money,” he said. If you live outside Toronto and you don’t have access to a car you only have access to about 5 to 10 per cent of the jobs in the area. If you live in Toronto and you don’t have a car you can access to about 30 per cent of jobs. Metrolinx CEO Bruce McCuaig, told the same TREB conference that transit and property values are closely linked. He called the affordability study good news. But it failed to consider the addition of new GO stations in Toronto or regional transit fare integration. The impact of RER could be even greater, McCuaig said in a statement to the Toronto Star. “Access to high quality, car-competitive transit, encourages (home) buyers to consider higher value properties than they might otherwise and that’s true in both the commercial sector as well as the residential sector,” he told the realtors. There will be 100,000 homes within 750 metres of the $5.3-billion Eglinton Crosstown LRT that is scheduled to open in late 2021, said McCuaig.